Harper Nielsen one small action may have taken a stand that will change the very song Australia sings about itself, writes the Rev'd Dr Ray Barraclough. PLANTING A SEED. Lighting a candle. Two metaphors to test the future. Time will tell whether the brave action of a nine-year-old Australian girl planted a seed that will grow into mature national awareness. Or will that small flickering light be readily and rapidly snuffed out by the unimaginative power-holders and opinion-makers of this ancient land? 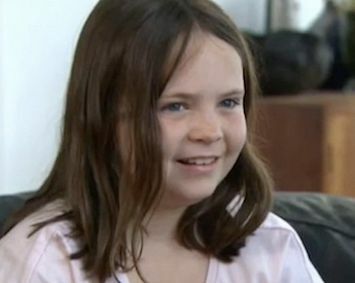 Nine-year-old Harper Nielsen took a stand, ironically, by daring not to stand during the playing of the Australian national anthem at her school assembly. 9-year-old #HarperNielsen refused to stand during the national anthem of #Australia out of respect for the nation's indigenous population. “The reasons why I don’t sing it or stand is because 'Advance Australia Fair' means advance white Australia. When it says we are young it completely ignores the fact that Indigenous culture was here for over 50,000 years before colonisation." Her words express a maturity that Australians would normally celebrate. But perhaps we do not live in a normal country. Queensland conservative politician Senator Pauline Hanson quickly branded her as being “a brat”. To borrow a slogan from America, in our supposedly most patriotic song, do we deny in modern Australia that “Black lives matter”? The Oxford Dictionary defines an anthem as ‘a patriotic song’. So are Australians to continue to piously sing a national song defining our identity and not include any reference at all to the human occupation of this land by the Indigenous people for over 50,000 years? Do they not matter? Why do we deny their existence as “First Nations’” when we assert that 'we are young'? At the Federation of the Australian colonies into the nation-state called Australia, Indigenous people were neither recognised nor acknowledged. The hugely disproportionate incarceration rates amongst Indigenous people in this land is a reality that sits uncomfortably with the notion Australians are all “free”. There is not a word in this patriotic song of the dispossession of this land’s original inhabitants. If “fair" means “a fair go” (and not a subliminal reference to whiteness) then what is “fair” in that dispossession? In 2009, noted Australian singer Judith Durham offered to the nation a more contemporary and realistic rendering of what could be our national anthem. We do not expect leadership from our leaders on this. This issue is about truth-telling, not about the usual reactionary response of the power-holding. A seed, a candle — such small objects. But from even a seed a tree can grow. Even a candle can shed light on a nation’s character. And what a delightful paradox! By not standing, this young girl may have taken a stand that will change the very song a nation sings about itself. One small action can express our solidarity with Harper’s action. As Australian citizens, we could dare to sit during the playing of the National Anthem. And in that sitting, a movement may grow that ushers in an anthem that all Australians can eventually stand for.